Big or small, Fortune 500 or the best of Arizona’s small businesses, Celebrated Cuisine has hosted delicious team building events for companies including Ameriprise Financial, Intel, Bank of America, Wells Fargo, Marsh Companies, Siemens, and McDonald’s. 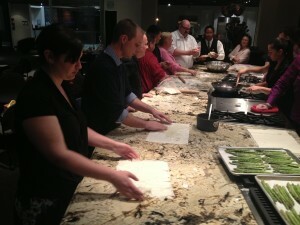 Communication is paramount – how does the team choose to divide and conquer each recipe? Flexibility – can the chefs for each recipe adapt to a sudden change or unexpected event (burned or substituted ingredient, broken sauce, dietary restriction/allergy)? Patience – are the chefs jeopardizing a successful outcome in a bid to complete a task first (compromising quality “to win”). In the event the group desires a little competitive edge, Chef Laura has designed mini contests to inspire participants to think on their feet. Upon completion of the day, Chef Laura will facilitate “Lessons Learned” and how it relates to the real work environment of the participants. “Team Cuisine” is now prepared to REALLY start cooking! 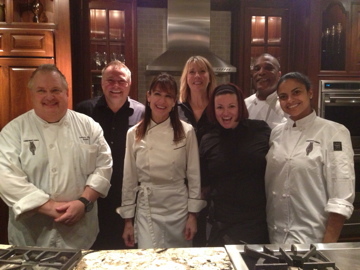 In Celebrated Cuisine’s “Team Cuisine” team building program, the kitchen is the learning environment for small groups of corporate executives, management and/or department teams to work together to create a wonderful, gourmet menu and then sit down together to enjoy it. A successful “Team Cuisine” experience provides activities that help every team identify their strengths, as well as weaknesses. Strategies are created for improving productivity and effectiveness. The versatility of the kitchen permits chef Laura to address creatively a wide range of issues, including communication barriers, resource allocation and conflict resolution in a non-invasive or threatening way. Through the experienced and careful guidance of Chef Laura, challenges to the group’s creativity, communication, cooperation and time/resource management skills are presented and everyone, regardless of culinary capability, participates to create a successful outcome.